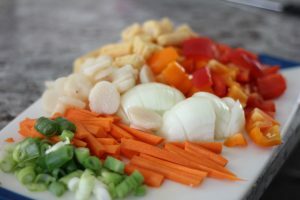 I made a life change and cut out a lot of foods that don’t react well with my body. I cut out gluten, dairy and many other foods. Since changing my diet my IBS and anxiety have significantly reduced and my skin is looking much more clear. Anyway, on to the dish I whipped up the other night. 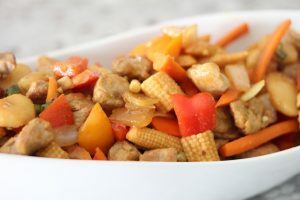 You can serve this meal with rice, but it’s honestly filling enough with out it. 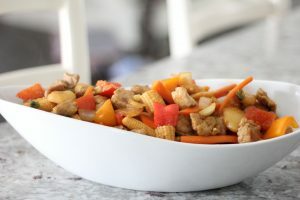 If you like leftovers this is a great dish, it heats up well and is delicious cold too! Chop all veggies to your liking. I prefer them to be cut larger vs diced small. 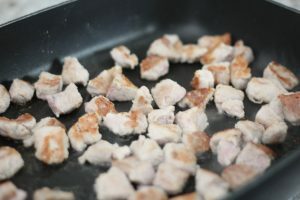 Cut pork tenderloin into chunks. Sprinkle coconut flour on the pork and mix around so it's coated. Drizzle avocado oil on the pan and add pork. Cook pork for 4+ minutes on one side and flip meat to cook through the other side. Once the meat is cooked removed from heat & place into a bowl. Add the veggies to the pan, drizzle more avocado oil. 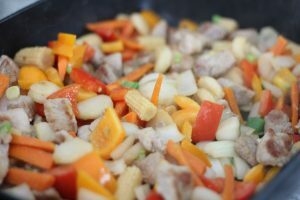 Cook veggies to your liking and add back in the pork. Pour 1/3 of the Annie Chun's Teriyaki sauce onto the veggies and pork. Pour the 1 packet of sugar in the raw in as well and mix. Once all mixed, it's ready to serve! Next Post Maine Eats ~ Portland Pie Co. Sounds like a good one to try ?? I am definitely trying this recipe out! Thanks for sharing the recipe! This looks amazing!